For a North Londoner, the prospect of traipsing to the opposite end of the city isn’t generally met with enthusiasm, especially not on a weekday. 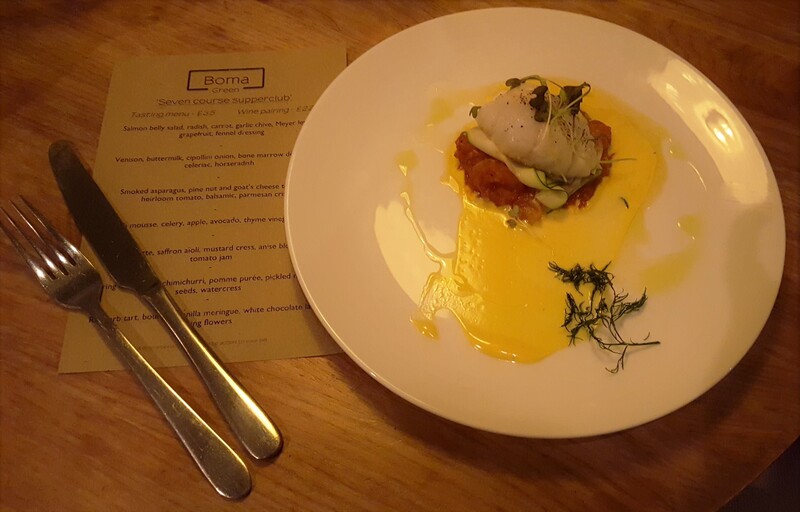 Foodies being adventurous types, though, I figured that since I’d been willing to wait in line for dessert at Shackfuyu, tuna tartare at Barrafina and a classic at Bao, why not trek to Parsons Green for a supper club offering a 7-course tasting menu? 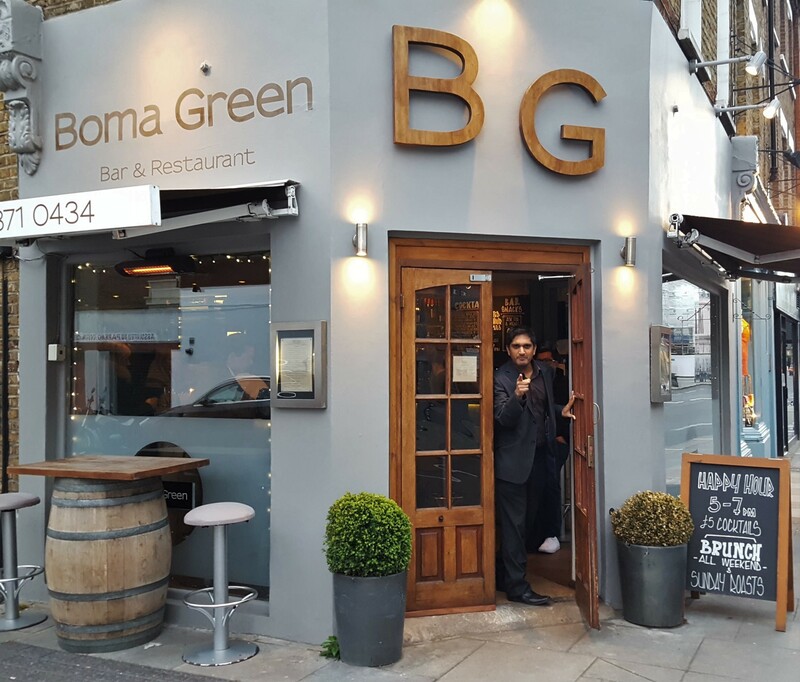 Priced at just £35 (£22 supplement for wine pairing), I was lured in by both the value for money and dish descriptions, and was also curious about the quality and experience since I hadn’t heard much about Boma Green. Chef Savla warning me to stop dilly-dallying. 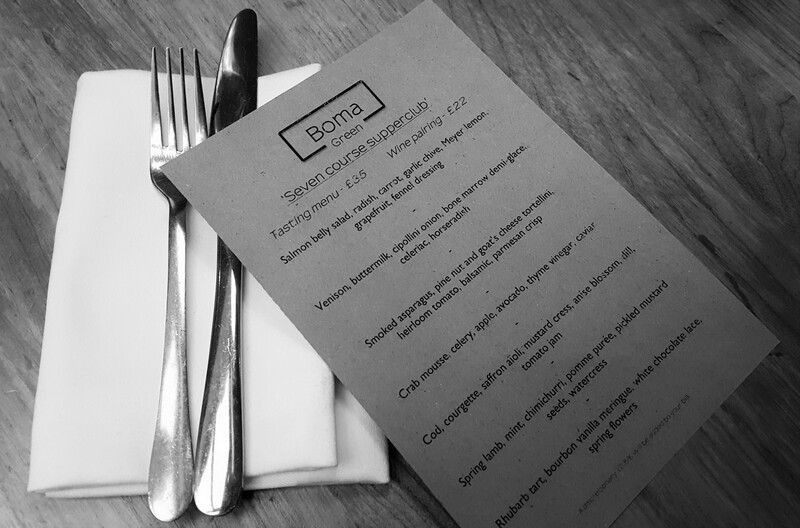 The website summary of “an independent group of hospitality-driven, neighbourhood restaurants” rings true; the interior radiates cosy yet contemporary comfort. 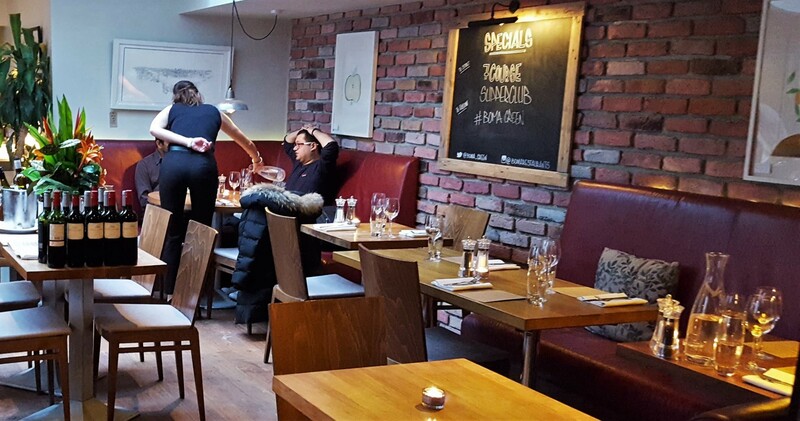 The entrance to the restaurant is via the bar, so diners are greeted with the sights and sounds of locals catching up over a drink before being led into a calmer, brighter space towards the back. First impressions are formed in a matter of minutes, and negative perceptions can be very difficult to overcome. In an era where social media reigns supreme, the customer experience starts well before they set foot on the premises. 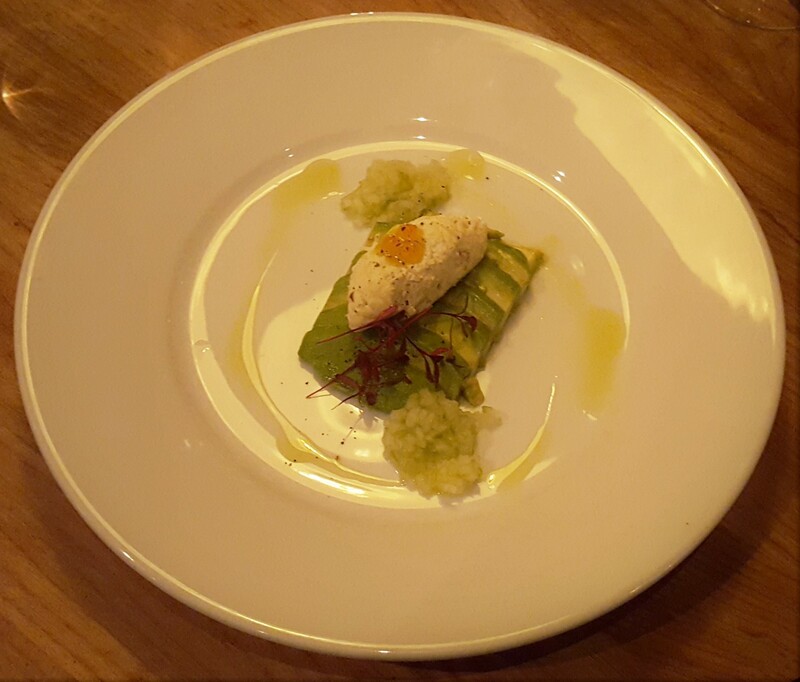 In the week leading up to our visit, RP and I tweeted our thoughts on the menu, in particular the crab mousse with avocado, as I’m not a fan of the former and he dislikes the texture of the latter. BG were quick to reassure me that the flavour of the mousse wasn’t overpowering and that it could be substituted for another dish. Several front-of-house staff remembered this on the day, enquired about my final decision then checked in after I’d tried it, including our waitress Louise. This attention to detail was impressive enough, then sommelier Kieran demonstrated that he too had done his research when he singled me out as a French speaker and tested me; Chef Savla, RP and I were knocked for six. To start off the feast, we had salmon belly with radish, carrot and grapefruit. The dressing contained Meyer lemon and so we’d expected citrus notes to dominate, which wasn’t the case. 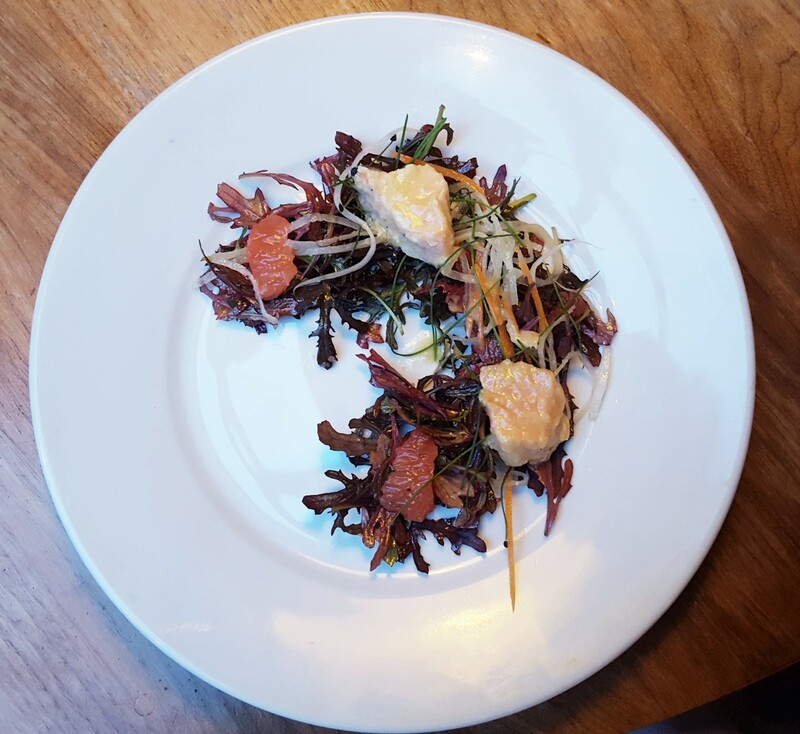 The crunchy vegetable strips worked well with the soft salmon, and the hints of garlic chive and fennel added warm undertones to the overall flavour profile. With this dish, we had Charquino (Albariño, Baixas, Spain, 2014); crisp and clean. 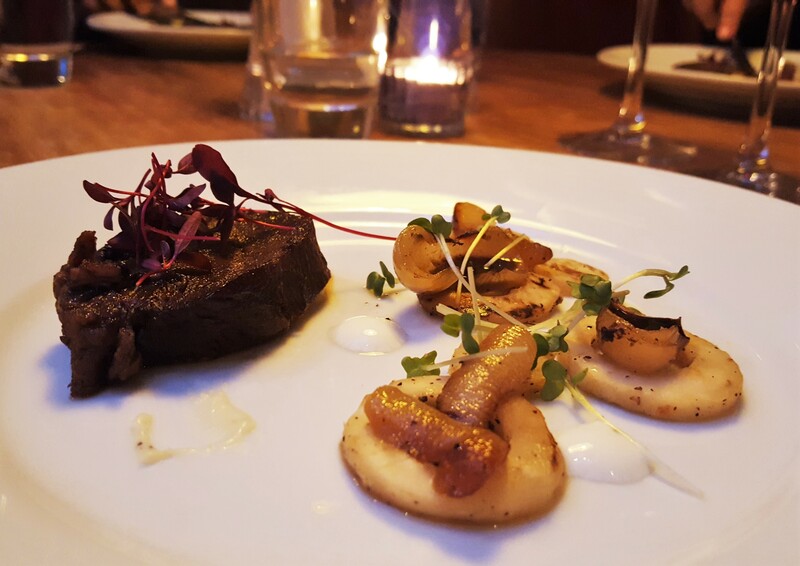 From fish to red meat: venison with bone marrow demi-glace and celeriac purée. The meat came apart easily and its gamey taste was tempered by the richness, fattiness, smoothness and sweetness of the other ingredients. With the flavours being so exciting, it’s just a shame that the presentation didn’t quite follow suit. A bold and juicy red was selected (Castillo de Jumilla, Monastrell, Jumilla, Spain, 2013), which stood loud and proud alongside the meat. 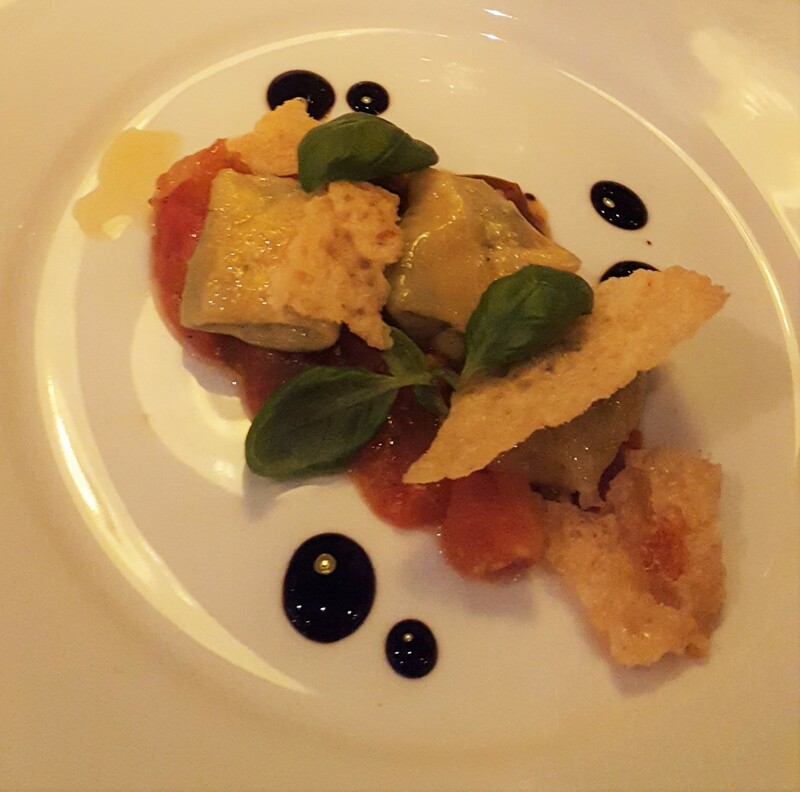 After the salmon and venison came a vegetarian delight: smoked asparagus, pine nut and goat’s cheese tortellini with heirloom tomatoes, balsamic and Parmesan crisps. This dish was comparable to a good marriage: the pasta and filling were the solid foundation, the tomatoes the moments of sweetness, the balsamic drops the intensity and depth, the Parmesan crisps the rough patches. Although we enjoyed this course overall, the crisps were chewy, and Chef Savla felt that the tomatoes needed a touch more seasoning. A glass of Sauvignon Blanc (La Prée, Touraine, Loire Valley, France, 2014) was served. Onto the crab mousse on avocado slices, flanked by celery and apple and crowned with caviar. Instead of returning it to the kitchen, I cleared my plate. Like a minor character in a play, the crab was part of the plot development, but the storytelling was left to the lead actors. For me, the strongest flavour was avocado, although RP disagreed, as the crab and caviar came through more for him. The last word goes to Chef Savla, who thought the crab was completely lost among the other elements. Our wine pairing was Luccio, Trebianno, Tenuta Roveglia, Italy, 2014. Next up was cod, courgette, saffron aioli and tomato jam. This was my favourite dish: cod cooked to my liking, mouthfuls punctuated by sugary tones from the tomatoes; texture provided by the courgettes, then a smear of yellowy goodness to tie everything together. Full marks for the taste and colours, but once again the presentation could’ve been improved. The Chardonnay (Marterey, Languedoc, France, 2014) was nice, albeit slightly too sharp. 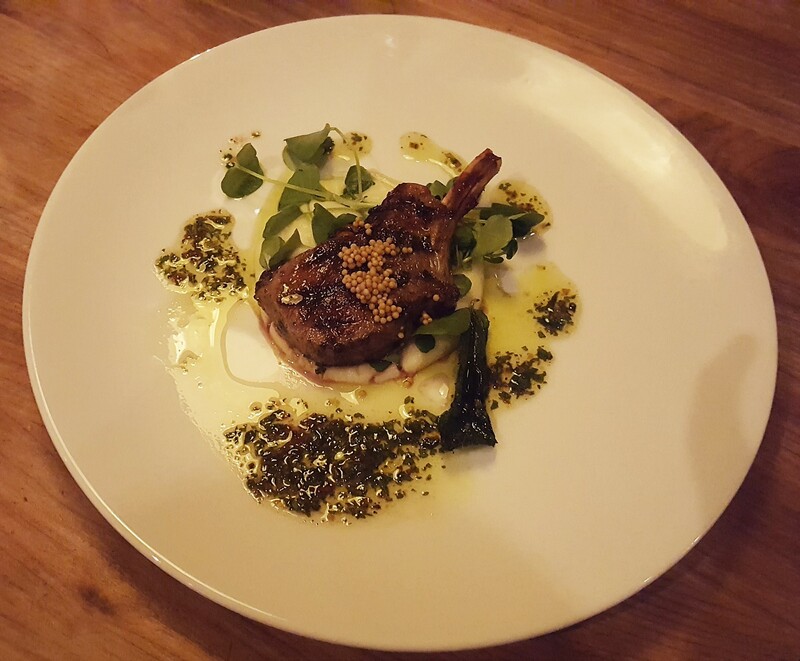 For the final savoury course, we had spring lamb with mint, chimichurri, pomme purée and pickled mustard seeds. Silence fell around the table as we devoured every last morsel. The lamb chop was juicy, with the various herbs gently elevating the flavour. The mustard seeds could’ve lingered too long on the palate, but the purée rounded off the edges nicely. It was such a satisfying dish that I actually picked up the bone with my fingers to clean it properly, which is as rare as a UK win in Eurovision. Back to red again with a magnificent Malbec (Seleción de Familia,Valcheta, Mendoza, Argentina, 2010), which held its own. 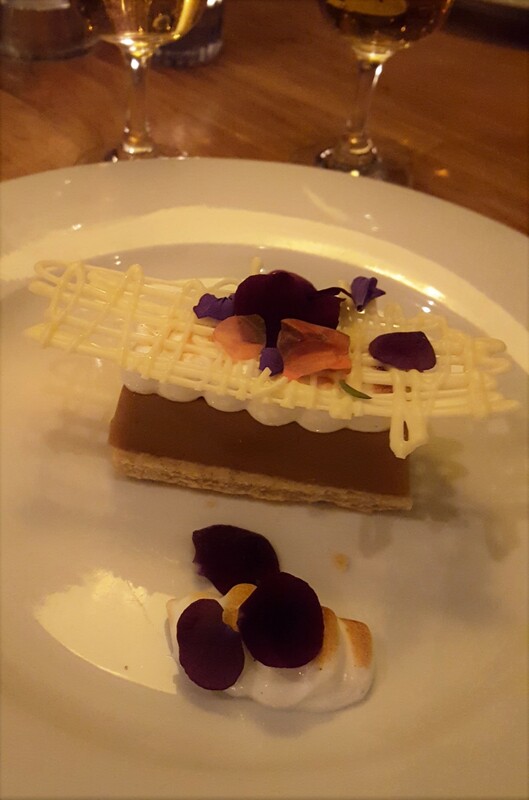 Six courses and six generous glasses of wine later, we were given a rhubarb tart, with bourbon vanilla meringue and white chocolate lace. By this point, I’d long stopped making notes, so this a good test of my memory. Again, the flavours were spot on, but the pastry let the side down as it was overcooked, therefore making it hard to cut. The final wine was De Bortoli, Botrytis Semillon, Vat 5, Australia; sweet without the sickly. 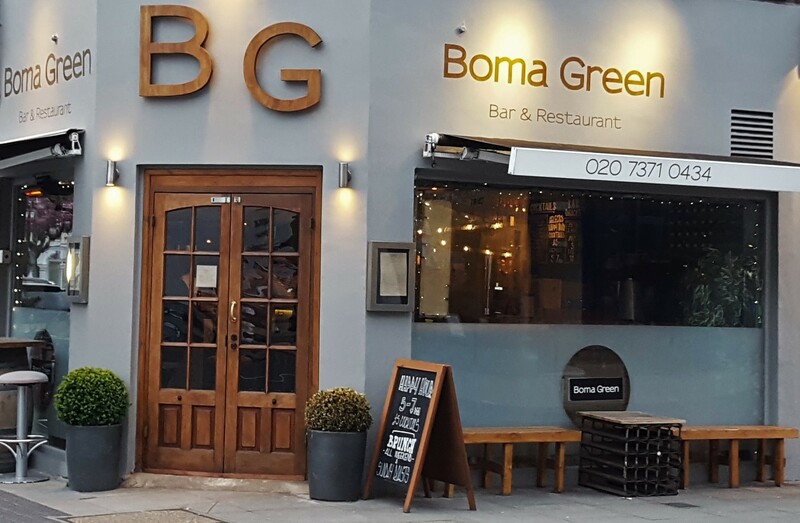 As Grace Dent points out in a recent review, “a good restaurant is like a symphony – it only gives pleasure if all the elements are playing harmoniously at once.” To continue the analogy, Boma Green has evidently rehearsed their pieces and adapted them for different audiences, instilling a sense of pride and professionalism in their players en route, so the y get a standing ovation from me. Dining here is like popping into your favourite local, where staff take the time to build relationships and remember the little things. The flaws were few and far between, and overwhelmingly outweighed by the unforgettable service. Last week, fellow food blogger @Steph_Blondoner posted a photo of their steak tartare, so they haven’t seen the last of me. I love your prose lady!